I was examining different ways to hold my Apple Pencil on the Smart Keyboard of my iPad Pro. It’s a difficult thing to pull off because the keyboard folds up in a lot of different ways, and finding the right spot to mount the Pencil has been challenging. I was originally thinking of purchasing one of Moxiware’s magnet stickers for the Pencil, but was a little concerned with some of the videos and reviews I saw on Reddit. The Pencil Magnet is strong enough for temporary storage on the iPad itself, but it’s not strong enough to help with storage during transit (the Pencil will still just fall off). I may still get one down the line, but my first priority was to find something to keep the Pencil tethered to the iPad Pro while it’s in my bag. During my recent trip to Japan I stumbled upon a metal pen clip in one of the many (many!) stationery stores. I was very careful to choose the orientation of the clip. 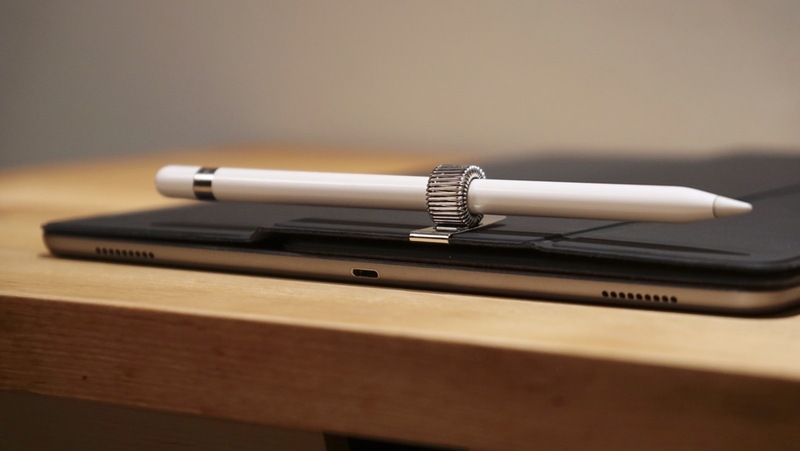 Many are vertical-style clips like this one from Muji, but I ended up choosing one that mounts vertically on the Smart Keyboard (kind of like this one from Rakuten), but holds the Pencil horizontally along the top of the tablet. I inserted the clip on the middle panel of the Smart Keyboard, since that’s the one that rests away from the iPad, and also prevents the metal clip from ever touching my iPad’s screen (because the keyboard is folded under it during storage). I’ve been using this accessory for about 10 days now and it’s a pretty workable solution for keeping my Pencil handy on the Smart Keyboard. First of all, the coiled metal is just tight enough to keep the Pencil reliably in place in my bag. This is a big deal to me because I do end up using the Pencil a lot more often if it’s just available. Even having to dig it out of a pocket, separately from the iPad Pro, is enough to cause me to forget to use it. Most of the time the Pencil is an accessory of convenience, so it really should be easy to keep close at hand. The coil is also just loose enough to help me slip the Pencil in and out without any trouble. However, this clip has proven to be a little more versatile than that. I didn’t realize this when I purchased it, but because of the flexibility of the coil, I can actually angle the Pencil outward while I have the Smart Keyboard set up to type. This means that I always have the Pencil peeking out from behind the iPad, ready to be used at a moment’s notice. No worrying about it rolling off the desk, or misplacing it underneath the paraphernalia on my desk. Charging the iPad Pro with the Pencil in place is a little tighter, but still doable. What I like most about this setup is that I don’t need to remove the Pencil when I’m packing up, either. 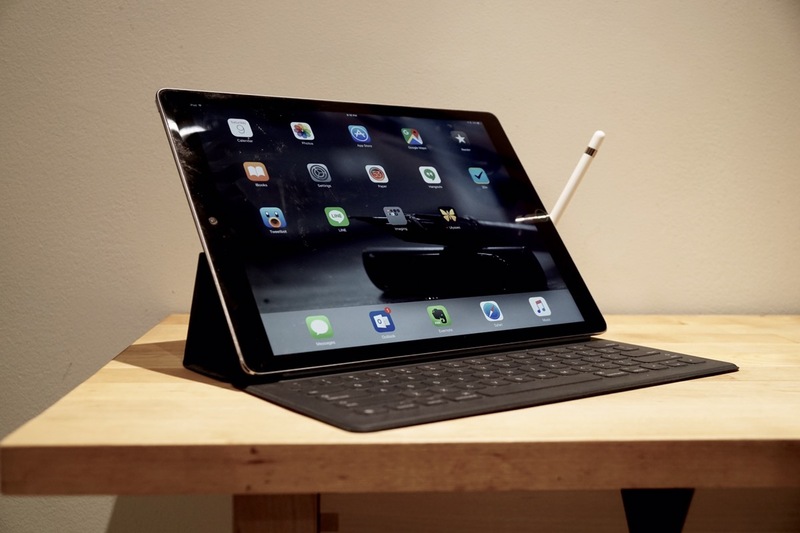 I can just lift the iPad Pro up, fold the Smart Keyboard, and chuck everything into my bag. There are two caveats though: this does add a bit of edge thickness to the iPad Pro in my bag, since the Pencil now sticks out of the front. The other is that this combo doesn’t work well when I’m standing the Smart Keyboard up in viewing mode. That hasn’t been an actual issue so far, though, since I usually prop the iPad up like that only for watching Netflix (so I do very little tapping). I may still invest in a Moxiware Magnet case down the line so that I can keep my Pencil on the iPad Pro without the Smart Keyboard attached. There are still edge cases — like sitting on the couch — where I’d like the iPad Pro and Pencil, but not the extra bulk of the keyboard. A magnet would really help there. However, since I use the iPad Pro at a desk 90% of the time, this pen clip is working out surprisingly well for less than $10.